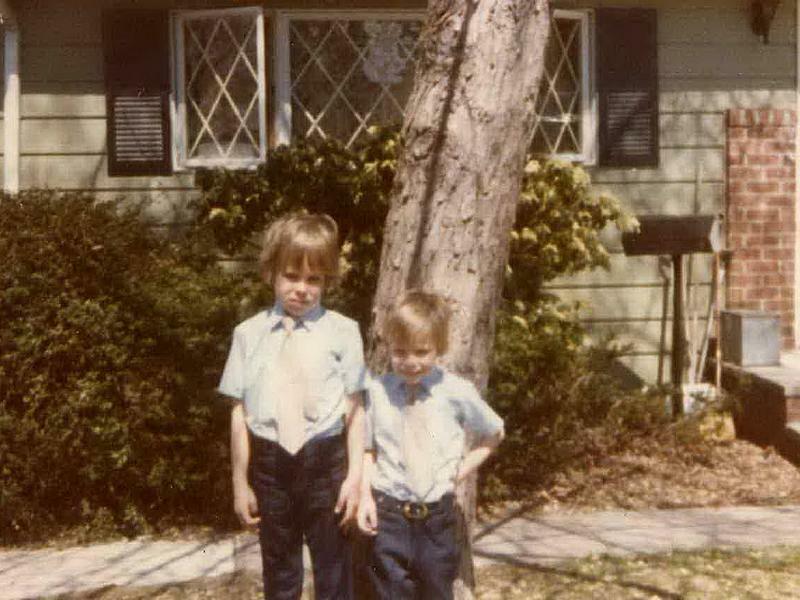 My sons, Danny and Mike, on Easter 1978. Eleven years ago today it was Easter. Flowers were blooming, the air was warming, and my house was full of people here to say goodbye to my son. Shannon and the kids celebrated with an Easter egg hunt in my back yard, and Mike watched some of it from the Mike-around on the deck. I was trying not to think about death in this season of rebirth, but it lurked around every corner of my existence. My house was abuzz with activity because Mike was dying. People were visiting, not because of the holiday, but because of Mike’s impending death. The food on the kitchen table and in the refrigerator was here because people brought it so I wouldn’t have to worry about cooking because Mike was dying. I was taking more time than I should off work because Mike was dying. Soon I would be out of vacation days and would have to take unpaid leave. I would find out a couple of days later that the publisher of the paper where I worked had overruled the editor who was charging me with vacation days after he discovered my colleagues had gotten together and donated 33 vacation days to me and my husband. One by one, they had gone into Human Resources and offered between one and three of their vacation days. The publisher stood in the middle of the newsroom and announced that everyone would have their vacation days returned and my husband and I would be able to take whatever time off we needed and still be paid. I’m still grateful for that, by the way. There are so many things we take for granted, but the support of friends can’t be overvalued in times like this. People from work and people from church visited. The contingent from Cary left late in the afternoon, leaving the house a good deal quieter. Mike seemed to appreciate it. I remember the constant aching in my heart. I remember holding back tears every time I saw him, now weighing less than 100 pounds, unable to get up without help, unable to walk without the walker, unable to eat anything more than a little nibble. But as soon as he opened his mouth and spoke, it was the same Mike. He was still irreverent and still funny. But my time with him was so damn limited now. I wanted to squeeze in every second I could with him. I even began to resent the naps he needed to take several times a day. I need people to know that the pain I felt 11 years ago is still fresh, still unbearable after all this time because he should still be with us. I need people to know that there are a half million others whose families feel this same pain because that’s about how many people who have died from lack of access to health care since my son died. If this is OK with you, stop calling yourself “pro-life” or “Christian.” You are neither. Jesus told us to heal the sick. He never charged a co-pay or a deductible. He never asked whether the sick person was working. He never asked to see an insurance card. We are the only industrialized nation in the world that hasn’t found a way to do this. There are no excuses. I reject all of them because every other nation has access to care for ALL people. I will not stop pushing for this. I will not go away. I will not give it a rest. I will fight for access to care for every human being, because I DO follow the teachings of Christ, and because I wouldn’t wish this on anyone — not even on all the presidential candidates who insist this can wait if we’ll all just be patient. If you are one of these candidates, please know that you will not get my vote under any circumstances. On this day 11 years ago, it was Easter, a day of rebirth. We would have just one week and two days left with him.